So, after my Christmas knitting turned out to yield less satisfying results – though I am continuing in search of more Mission Falls 1824 wool in the hopes of getting some more a bit closer to my dye lot(s) – I decided that at New Year’s I would start something new that would just be a single skein project. No need to worry about changing between dye lots, after all, when you’ve just got the one skein. I cast on something else in dark purple (since I liked that dark purple Mission Falls even if it was ill-fated), and went with a Union Station beret since it’s my own pattern and therefore familiar, and also, who doesn’t want more winter hats in January? I’ll take all I can get, that’s for sure. The yarn is Berroco Ultra Alpaca (one of my favourite yarns) in ‘beetroot’, a dark enough purple that it could almost be considered a neutral, but still purple enough that it’s got colour and interest to it. I’ve been toying a lot more these days with the idea of knitting with darker colours. Even though the stitch patterns are less visibly dominant unless you’re up close, dark colours have a very dressy look to them and some days that’s a nice thing to have in your knitwear. I’m working away at this a few rounds at a time in between other projects, and have grand fantasies of a matching pair of gloves while the weather is still cool. Also, speaking of fitting in projects – it turns out that seeing the James Bond movie a second time means you can get about this much of your second ribbed sock done at the same time. (I love plain ribbed socks for movie theatre knitting – they’re simple enough that my fingers can feel what they’re doing even if I’m not looking at it, and I just save the heels for other times. Movie + Sock Knitting, a combo coming soon to a Knitter’s World of Leisure near you). Have a good knitterly weekend, knitter friends! Glenna, I just love your blog. I look forward to each post. Me too! I have no clue how you manage to knit in the dark!! I’d be too scared to make a mistake. How come you can knit twice as much in a dark movie theater than you can watching the same movie at home, in the light? You have to plan your movie knitting for simple ribbing or stockinet stich, but wow, can you get through a lot of yardage! Love the purple and you can never have enough accessories! I love knitting with deep, saturated colors like that purple. It’s just a matter of finding a pattern that suits it. Looks like you’ve done that! 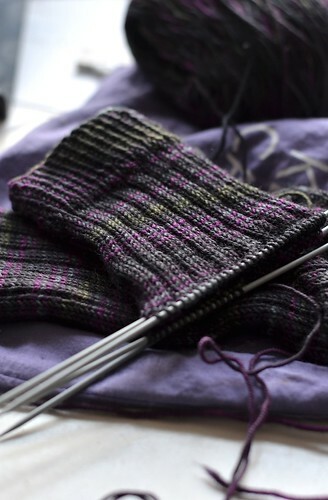 Oh my goodness….knitting socks while watching a movie. How I wish I could do that! I’m so envious of you blogging about cold weather as we’re in the middle of summer where I am in Queensland, Australia…..in fact the whole country is experiencing shocking heat – up to 45 degress celsius which is very, very hot. Luckily, here in Brisbane it’s around 29-30 degress celsius so I am still able to knit….not that hot weather stops me….I just turn on the air conditioning or the fan and think cool thoughts. had to laugh at you knitting socks in teh movie. I knit hats like that and amaze my friends. As it is pure knit on circular needles, it could NOT be easier. Not sure I would try ribbing on double points though – good job! That really is a gorgeous purple, and though I never thought about its being a neutral color when it’s that dark, I completely agree! I love that purple! and I like your socks! I haven’t tried knitting in the movie theater yet, that will be on my list of to do’s! I’m with you, Berroco Ultra Alpaca is one of my favorite worsted weight yarns too. I never thought of dark purple being a neutral color but I agree too! Gorgeous! Seriously?! Movie knitting! I have got to try that!! Love a new challenge! Ok I experimented at home in front of the tv with the lights off. 16 circular needles, stockinette stitch. No problem!! Yay. I probably won’t do it every time but it is an option! I doubt I could do it on anything more complicated and definitely not on dpn’s I’m going to try it out next week! Gorgeous color and stitch pattern! What is it with the purple? I’ve just emerged from a grape Kool-Aid dyeing session which has produced a lovely dark purple handspun, and for some reason I also found myself looking at more purple Galway on my stash shelf. I might be in love with your sock yarn. I’m also a big fan of Berroco Ultra Alpaca, such a versatile, soft and warm yarn. 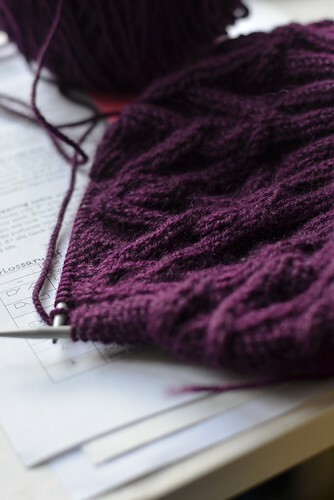 Patterns you shown to knit in the new year is awesome. Thanks for sharing this nice wool pattern. Knitter’s World of Leisure … Where do I get tickets? I love your sweater designs, several are matched up to stashed yarn that has been waiting for the “right” patterns to complete them 🙂 . Thanks for the informative blog and beautiful knit items. Hi Glenna! 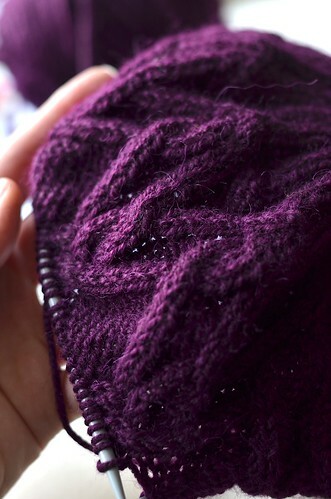 What’s your method of avoiding “laddering” when making ribbing with double-pointed needles? (and in the dark no less!) So far I’ve found that if I start ribbing with a purl stich I won’t get one big stretched out purl column inbetween each needle. Any other suggestions? I’m visiting your site after reading Cathy’s “Beautiful Blogger Award” post. I know nothing about knitting. My blog is about writing. I spin yarns with words, not wool. It looks like you have some great projects here. Keep up the good work. First time knitting during a movie in a theatre today. First it felt weird -like two worlds were colliding 😉 but it worked ok. I didn’t drop any stitches so that’s a plus.